Alternative media outlets have been enthusiastically sharing the news that the almost mythical plans for a trans-Iranian Caspian Canal are once more inching towards reality, eagerly welcoming such a move as being in all of the Caspian States’ ultimate self-interest. As true as that is in pertinence to the economic front and even somewhat to the geopolitical one as well, these analyses are so caught up in the positive transformative effects that this initiative would have that they neglect to consider the long-term and possibly negative strategic impact that such a literally earth-moving project might also result in. The purpose of the present article isn’t to condemn the prospective trans-Iranian Caspian Canal, but rather to engage in a sober assessment of the projected long-term geostrategic ramifications that it will irreversibly have for the Caspian Sea region and Russia’s southern frontier. The report is designed to encourage Russian decision makers to coldly examine this issue without the overly optimistic bias that has clouded the judgement of others, thereby hopefully enabling official Moscow to reach a neutral conclusion about this project. Correspondingly, after recognizing some of the strategic risks that the Caspian Canal can inherently open up for Russia, the country can then begin to proactively prepare itself in responding to these incipient challenges. The research starts off by providing a broad strategic overview of the latest iteration of the proposed Caspian Canal and then proceeds to identify which of the two discussed routes would be most beneficial for Russian interests. After having done this, it transitions to analyzing how the successful completion of either geographic manifestation could enhance the geostrategic positions of Iran, Russia, and India. Pertaining to the latter, particular attention is paid to how the insertion of India as a direct strategic competitor in the Caspian and Central Asian regions might lead to uncomfortable complications for Russia’s policy in this interconnected theater. While the South Asian state is presently very close to Russia, if India continues along its pro-American and pro-Saudi trajectory, it’s very possible that it’s new “friends” might compel it to make a difficult and unnecessary “either-or” choice that could turn the Eurasian members of BRICS against one another and lead to New Delhi becoming a unipolar spear in the heart of the supercontinent. Two variants for the Great Persian Canal, the western route (blue) and the eastern route (red). As is visibly demonstrated, the western route would connect to the Persian Gulf most likely at the port of Bandar-e Emam Khomeyni, while the eastern one would probably link up to the Indian-financed port of Chabahar. It’s useful to mention that Chabahar is India’s ‘answer’ to China’s investment in Pakistan’s nearby Gwadar port, both of which are in the transnational sub-state region of Baluchistan that has previously experienced separatist and terrorist violence. The worthiness of including this detail is to demonstrate the potential for a third-party actor such as the US to interfere with each Eurasian Great Power’s respective port project in the region and use this strategic blackmail potential as a means of pressuring New Delhi or Beijing at Iran or Pakistan’s expense, respectively. Relatedly, this is most relevant to the given article if the eastern route is chosen for Caspian Canal and Chabahar receives an even greater boost to its already mighty geostrategic significance in India’s grand planning, although it still has a general pertinence even without this and should be kept in mind for when the research discusses India’s plans to make inroads in Central Asia. As the country through which the Caspian Canal would have to traverse, Iran certainly has its own intrinsic interests in the project that transcend economics. From the Iranian perspective, the western route is more geopolitically attractive than the eastern one because of the reinforced dependence that it would create on the Strait of Hormuz. Tehran wants all direct stakeholders in the project (the Caspian States and India) to unconditionally support it against the Saudi-led GCC and “anti-terrorist” coalition, especially in the event of war, and the most surefire way to indefinitely retain their strategic ‘loyalty’ is to make a substantial part of their economic futures directly dependent on Iran and its sovereignty over part of the Strait of Hormuz. The eastern route is more advantageous to the Caspian States and India precisely because it avoids the Strait of Hormuz, but the way that Iran likely sees it, this makes them less likely to commit to supporting it in the event that hostilities arise in the Persian Gulf. However, if these states were dependent on that waterway and the bottleneck Strait of Hormuz in facilitating their direct bilateral maritime trade with one another, then they’d likely side a lot closer with Iran if the aforementioned scenario ever transpired. This strategic reality thus makes it possible for Iran to assemble its own counter-coalition under whatever pretexts it likes in order to balance against Saudi Arabia and deter any multilateral aggression that it decides to launch against the Islamic Republic, understanding that each of the direct Caspian Canal stakeholders also have a stake in Iran’s security by obvious extension. In sum, while Iran might dangle out the possibility of a Caspian Canal through its territory and market it on win-win economic grounds, it actually has concrete geopolitical reasons for digging it vis-à-vis multilaterally deterring any possible aggression by Saudi Arabia and its allies. Whether the canal goes along the western or eastern route, all direct stakeholders will become more firmly tied with Tehran than they are with Riyadh, thus helping to win over their geopolitical ‘loyalty’ and retain it for generations down the line. Although Iran likely wants to take the easiest, shortest, cheapest, and most geopolitically beneficial route, combined lobbying from the Caspian States and India, as well as the issuance of generous development grants by Moscow and New Delhi, might sway the Ayatollah into opting for the eastern path instead and thereby mitigate some of the strategic risk that all stakeholders would have in becoming dependent on the Strait of Hormuz and Persian Gulf waterways. Moscow’s obvious benefit in the construction of any trans-Iranian Caspian Canal is that it would be able to more solidly diversify its economic partnerships through the opening up of a global maritime trade route along its southern frontier, which would also enable the Caspian Flotilla to connect to the Indian Ocean. This would complement what the author has previously written about Russia’s “Southern Shift” by making the North-South Corridor between Russia, Iran, and India a much more robust development zone and more freely inviting any other participant in the world to take part in it. Consequently, the Caspian Sea city of Astrakhan would become Russia’s “Window to the South”, just as Saint Petersburg is the “Window to the West” and Vladivostok is becoming the “Window to the East”. Taken together with Russia’s other geo-economic determinants, the Caspian Canal fits nicely with Moscow’s grand strategy and might prove to be the pivotal project that the country needs in order to achieve a genuine economic renaissance in the coming decade, which would of course also transfer to corresponding geopolitical advantages in each cardinal direction. On the flip side, there’s a very real possibility that the Caspian Canal could also be used to transport naval forces in order conduct “friendly exercises” in Iran’s portion of the Caspian Sea. While its full maritime borders have yet to be delineated owing to the longstanding differences that Azerbaijan, Turkmenistan, and Iran all have over this issue, it’s still recognized that there already are some parts of that body of water that unquestionably fall under Iran’s sovereignty, and with the full canal also being under its control as well, there’s no reason why Tehran couldn’t make the decision to stage naval war game exercises with any prospective non-Caspian partners there. Such a move would only be done with the most privileged of Iran’s partners, so barring any regime change scenario where the country converts into a pro-Western ally, then it’s most likely that this would happen with India more so than with any other country. From the Russian perspective, although a joint statement was made in 2014 by all the Caspian States in prohibiting non-regional military presences in their shared waters, this vague declaration could easily be argued by Iran as meaning no permanent presence and thus not preventing the temporary stationing of ‘friendly’ forces during the commissioning of joint or possibly even multilateral naval exercises. Furthermore, just as the Montreux Convention limits the length of time that non-regional navies can spend in the Black Sea, the Iranians might interpret whatever forthcoming and binding agreement that might be reached on the Caspian Sea in a similar manner, whether it’s explicitly stated within the text or not. Also of pertinence is that Iran will probably not limit itself to an exclusive agreement with the Russian Navy in facilitating the Caspian Flotilla’s access to the Indian Ocean, and if it allows Russian military vessels to transit the canal, it would follow that it might grant such access privileges to other countries’ fleets too, since there’s nothing stopping it from exercising this sovereign right over its internal waterway. The problem with all of this is that India is moving towards the unipolar world in such a rapid manner out of its establishment’s perceived need to “contain China” that it’s impossible to accurately predict what its ultimate loyalties might be in the coming decade. This could in turn lead to a strategically uncomfortable situation where Iran enables the passage of pro-unipolar Indian naval units into the Caspian Sea for joint military exercises (doing so based on the strong bilateral bond between Tehran and New Delhi, not to kowtow to the West), but which has the unmistakable effect of symbolically and substantially projecting disruptive Indian influence into the joint Russian-Chinese leadership space of Central Asia, not necessarily to challenge Russia, but certainly to send a strong “containment” message to China. The effect, however, would be still be decidedly negative for Russia. India, and likely by that time also Iran and in full concert with New Delhi, would be asserting itself into the Eurasian Heartland and complicating the traditional and stable dynamic that has been in place there as a result of the Russian-Chinese Strategic Partnership. There’s a fine line between multipolar engagement via trade and soft power mechanisms and outright challenging one’s supposed set of partners, and if India uses the Caspian Canal as a means to project military influence in the region under the thin guise of staging “joint naval exercises with Iran” there, then it would definitely be overstepping the boundaries of ‘friendly competition’ and throwing down the gauntlet against China (and by extension, against Russia as well, whether it intends to or not). The New Delhi establishment is stuck on the idea of “containing China”, seeing in Beijing a major threat not only because of its size and existing geopolitical importance in global affairs, but most directly because of its strong strategic alliance with Pakistan as embodied in the China-Pakistan Economic Corridor. As a means of “containing China”, India is ‘pushing back’ against it in South and Southeast Asia, and it plans to proactively ‘take the battle’ to Central Asia in the coming future. With the intent of bolstering its strategic capabilities, India is teaming up closely with the US, and this overlap of shared objectives is expected to move in sync to Central Asia whenever New Delhi more assertively expands its influence there. In parallel to “containing China”, India has also sought new logistical routes for diversifying its trade ties with the EU, particularly through employing the North-South Corridor via Iran and Russia. This can be taken to mean that no matter how closely India might end up siding with the unipolar world in its determined (and narrow-sighted) quest to “contain China”, it’s not expected that New Delhi will do anything to jeopardize its ties with Moscow due to the irreplaceable geo-economic role that Russia is envisioned to play in India’s grand economic planning. That’s not to say that the US won’t try to apply pressure on India to do so, it’s just that any negative consequences to this effect would only impact their top-level stage of geostrategic coordination and will likely not filter down to adversely affect business and socio-cultural engagements. It would still be a step backwards for the multipolar world if something came between the Indian and Russian leaderships to impede their strategic relations, but to tell the truth, the two sides have only really been cooperating in the economic (including military-technical) and socio-cultural spheres for the past couple of decades anyhow, and despite the upbeat rhetoric from both sides, it doesn’t look all that realistic that they’ll ever return to their Cold War-era level of tight geopolitical coordination due to the changing global circumstances that have unfolded since that time. The fundamental uncertainty is the level to which bilateral relations will be affected as India inserts more and more of its influence into Central Asia, particularly along the “Ashgabat Agreement” corridor route along the Caspian Sea’s eastern littoral and inland areas. To bring the reader up to speed, this little-known economic-logistical vision aims to integrate Kazakhstan, Uzbekistan, Turkmenistan, Iran, Oman, and after officially beginning to accede to it just last month, now India into an alternative development spoke of the North-South Corridor. 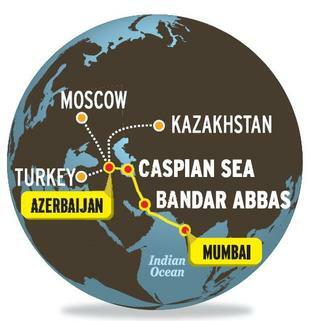 There already exists a rail route linking Kazakhstan, Turkmenistan, and Iran which was opened at the end of 2014, and India’s plans to build a railroad from Chabahar up to the northwestern Afghan city of Herat will likely result in a link-up with the trilateral transnational project along the eastern Caspian. Such a move would dovetail with India’s “Connect Central Asia” plans in seeking to build new trade routes and infrastructure networks throughout the region, and the full series of projects could likely be marketed as an “Act North” policy to liken it to New Delhi’s confident projection of influence in ASEAN by means of the “Act East” initiative. To return to how this relates to Russia, India’s trade with the country would prospectively be conducted either through maritime trans-Caspian routes or a railroad corridor through Azerbaijan. The eastern spoke of the North-South Corridor will likely deal mostly with India’s bilateral and multilateral engagement with Central Asia and outside of the direct framework of its ties with Russia, and again, all based mostly on the objective of “containing China” more so than accessing a comparatively smaller market than ASEAN or Iran. The geostrategic overtones of India making inroads into Central Asia is what trumps any projected economic benefit and more than compensates for the infrastructure investments that New Delhi will likely make pursuant to this. As the cherry on the cake, if the Caspian Canal is ever completed, it’s highly probable that India would take advantage of the geographic opening that this creates in order to regularly send its navy into the Caspian and carry out bilateral or multilateral exercises with its Ashgabat Agreement partners of Kazakhstan, Turkmenistan, and/or Iran. Reviving the century-old proposal for a trans-Iranian Caspian Canal is an exciting proposal in the post-sanctions geopolitical environment, and it carries with it tremendous opportunity to greatly enhance the viability of a multipolar global economic order. Many optimistic assessments have already been written about it, but each of them avoids discussing the manner in which the primary Russian-Iranian-Indian beneficiaries would be strategically affected in the long term. Furthermore, no serious analyses have been made about how this project would irreversibly transform the geostrategic situation in the Caspian Region and invite new, nontraditional risks for Russia, chief among them the possible evolution of India from an Indian Ocean “multipolar” state into a Caspian Sea-encroaching unipolar battering ram. While this process wasn’t extensively discussed in the present work, its realistic possibility cannot at all be discounted, especially when considering the close level of strategic coordination presently underway between New Delhi and Washington. In the event that the unipolar world manages to coax India into its clutches (perhaps even with the Damocles’ Sword of Hybrid War), then New Delhi’s “Connect Central Asia” initiative might end up becoming a ‘Trojan Horse’ inside the Eurasian Heartland, and the subcontinental state might abuse its prospective access to the Caspian Sea in order to stage provocative bilateral or multilateral naval exercises along its shores. Although just a strategic scenario projection for now, this is a possibility which mustn’t at all be left out of the discussion when Russian decision makers debate the pros and cons of the Caspian Canal. India’s potential to evolve from being a reliable partner into a rival player is a very real possibility in the coming decade, and if New Delhi chooses to undergo this shift and takes corresponding action in the Caspian Sea in order to send a strong “containment” message to China, then it would instantly put Moscow in an uncomfortable position. Russia would be pushed into voicing its reservations (however discretely or explicitly) so as to protect its own self-interest of preserving stable regional leadership in the area alongside China and in standing solidly by its main ally’s side in the face of India’s provocative actions against it. The resultant consequence of this could be to fray Russian-Indian ties even more than they would already have been by that point and to complete the decoupling of the two side’s prior geopolitical coordination, devolving their bilateral relations from the top-level strategic tier to medium-level and pragmatic economic (including limited military-technical) and socio-cultural engagement. Nevertheless, it can be expected that before this happens, India might make a last-ditch effort to convince Russia that the North-South and Ashgabat Corridors are more important to its grand strategy than the China-Pakistan Economic Corridor is, in obvious response to Moscow’s increasing propensity to see Pakistan as the “zipper” of pan-Eurasian integration. New Delhi probably won’t ever succeed in persuading Moscow to abandon its newfound partnership with Islamabad because Russia self-interestedly prefers to pursue all three north-south opportunities simultaneously in order to bolster its geo-economic flexibility. If Russia rebuffs India’s anti-Pakistan lobbying efforts, then New Delhi might actually display a touch of vindictive schadenfreude if it ever abuses the Caspian Canal to send its naval forces along Moscow’s southern maritime frontier.